The Catholic Artistic Imagination series continues on campus with an event that will explore the art of satire and instances of its use within and against religious traditions. 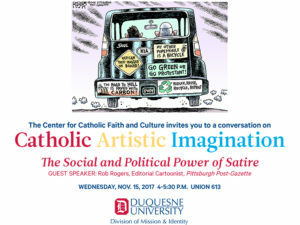 Sponsored by the Center for Catholic Faith and Culture, The Social and Political Power of Satire will take place on Wednesday, Nov. 15, from 4 to 5:30 p.m. in Room 613 of the Union. While previous events in the series have focused on visual and musical forms of art, this event will explore the artistic genre of satire and how it is used for the purpose of social criticism and reform. 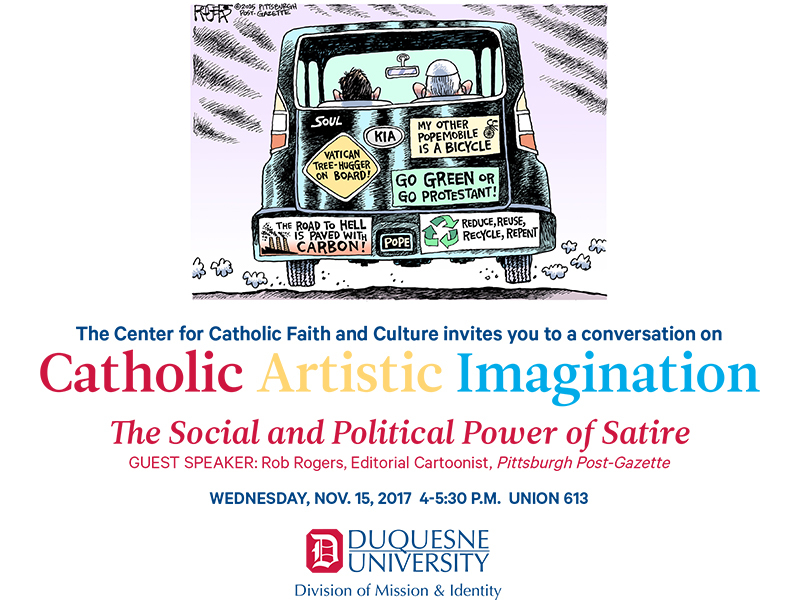 The Social and Political Power of Satire will feature award-winning editorial cartoonist Rob Rogers, whose work is regularly featured in the Post-Gazette, New York Times, Washington Post and USA Today. He will share his expertise and discuss how he finds inspiration for his work. The first 20 registered attendees for the event will receive a free signed copy of Rogers’ Pittsburgh-based cartoon collection Mayoral Ink: Cartooning Pittsburgh’s Mayors. His 25th anniversary collection, No Cartoon Left Behind, will also be available for purchase. The Catholic Artistic Imagination series celebrates the social, communicative and humanizing power of the arts. This series was developed to explore Catholic artistic imagination through appreciation of art informed by Catholic faith as well as through reflection of other art through a Catholic perspective. The Social and Political Power of Satire is free and open to the campus community. Drinks and hors d’oeuvres will be available. Space is limited. RSVP by this Friday, Nov. 10, at www.duq.edu/CAI-satire.